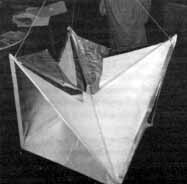 As reported in the January-February 1995 Skeptical Inquirer, a September 1994 Air Force report strongly supported the theory that the "UFO" debris found by rancher Mac Brazel in 1947 northwest of Roswell, New Mexico, was in fact a remnant of a balloon flight launched as part of a top-secret program called Project Mogul. The possible connection between the Roswell Incident and Mogul was first realized by researcher Robert G. Todd, and independently by Karl T. Pflock. Recently, Charles B. Moore, one of three surviving Project Mogul scientists identified in and interviewed for the Air Force report, spoke to the New Mexicans for Science and Reason (NMSR) in Albuquerque. He discussed the background of the project, the New York University (NYU) balloon flights, and the Roswell connection. He provided new details that would appear to virtually clinch the idea that the debris Brazel found was indeed from one of the Project Mogul flights that Moore helped launch. What follows is based on Moore's presentation, his answers to audience questions, subsequent meetings and discussions with him, documents he provided, and a monograph he is preparing on these flights. Moore, professor emeritus of physics at New Mexico Institute of Mining and Technology in Socorro, was a graduate student working for NYU back in 1947. The Mogul project was so classified and compartmentalized that even Moore didn't know the project's name until Robert Todd informed him of it a couple of years ago. The unclassified purpose of the project was to develop constant-level balloons for meteorological purposes. Its classified purpose was to try to develop a way to monitor possible Soviet nuclear detonations with the use of low-frequency acoustic microphones placed at high altitudes. No other means of monitoring the nuclear activities of a closed country like the USSR was yet available, and the project was given a high priority. One of the NYU tasks was the development of constant-level balloons for placing the acoustic microphones aloft. After some preliminary flights in Bethlehem, Pennsylvania, in April 1947, which failed due to high winds, the project moved to New Mexico. In June and early July 1947, numerous NYU balloon flights were launched from Alamogordo Army Air Field in New Mexico. Some of these flights consisted of very long trains containing up to two dozen neoprene sounding balloons, having a total length of more than 600 feet. Moore makes a strong case for the hypothesis that NYU Flight #4, which he helped launch on June 4, 1947, was the source of the debris Brazel found on the Foster ranch, and therefore the source of the "Roswell Incident" itself. Many of the materials used in Flight 4 bear striking similarities to pieces of the Roswell debris. A diagram of an earlier, similar flight, Flight #2 (launched April 18, 1947, from Bethlehem, Pennsylvania) shows the balloon train. No such diagram is available for Flight 4; since no altitude data were obtained for it, it was not included in formal NYU reports. However, Moore says the configuration for Flight 4 was quite similar to that shown. The large octahedral objects at top left and bottom middle are radar reflectors, which were used for tracking. Several small aluminum rings for handling the lines are indicated; the "payload" (a sonobuoy) was supported by slightly larger rings. The cluster of neoprene sounding balloons extended for hundreds of feet in flight. The debris Brazel picked up--and which was later taken to Fort Worth, Texas, for inspection by Brigadier General Roger Ramey, the Air Force commander there--matches NYU Flight 4 in several different ways. Some of the debris consisted of patches of a smelly, smoky gray, rubber-like material, which is consistent with the neoprene balloons used in NYU Flight 4. Much of the Roswell debris--sticks, metallic paper, and strangely marked tape--is similar to material used for the radar reflectors. When Warrant Officer Irving Newton saw the debris in General Ramey's office, he recognized it as pieces of a radar target. Moore points out that the Ramey photographs show parts of more than one reflector; Flight 4 contained three Signal Corps ML-307B RAWIN targets. Many witnesses of the debris described tape with flower designs or hieroglyphics on it. Moore recalls that the reinforcing tape used on NYU targets had curious markings. "There were about four of us who were involved in this, and all remember that our targets had sort of a stylized, flowerlike design. I have prepared, in my life, probably more than a hundred of these targets for flight. And every time I have prepared one of these targets, I have always wondered what the purpose of that tape marking was. But . . . a major named John Peterson, laughed . . . and said 'What do you expect when you get your targets made by a toy factory?'" The radar targets contained small eyelets. Moore showed the NMSR audience a similar target with the eyelets. In an article in the Roswell Daily Record on July 9, 1947, rancher Brazel described the debris as having no strings or wire, but as having eyelets for some sort of attachment. While many UFO proponents claim the wreckage shown in General Ramey's office was just a weather balloon switched for the "real debris," Moore pointed out that the radar targets used by NYU were unlike anything flown in New Mexico before and that "they were not available in Fort Worth to be substituted for the debris in General Ramey's office." Warrant Officer Newton was able to recognize the debris in General Ramey's office because he happened to have used an early version of the same targets while serving as a weatherman in Okinawa. The earlier-model targets Newton used did not have the reinforcing tape with the pinkish-purple flower designs. Brazel's daughter, Bessie Brazel Schreiber, in a 1979 interview conducted by author William Moore (no relation to Charles B. Moore), described some aluminum ring-shaped objects in the debris that looked like pipe intake collars or the necks of balloons. (The mention of the rings appears in William Moore's transcript of the interview, but was not included in his book The Roswell Incident.) She estimated that they were about 4 inches around, and said she could put her hand through them. Charles Moore points out that Flight 4 carried several 3-inch-diameter aluminum rings for assisting with the launching of the balloon train, as well as larger rings used to hold the sonobuoys. These were cut from cylindrical tubing stock, and then chamfered to prevent damage to the ropes. Sheridan Cavitt, the CIC (Counter-Intelligence Corps) officer who accompanied Major Jesse Marcel to the debris field, described a black box in the wreckage. Moore says the NYU crew routinely packed batteries for the acoustic equipment in black boxes. There has been some speculation that the black box might have been a radiosonde, but Moore pointed out that radiosondes are usually white to prevent absorption of heat. On June 4, 1947, Flight 4 was launched, and tracked as far as Arabela, New Mexico, only 17 miles from the location of the debris field on the Foster ranch. Flight 4 was still aloft when the batteries ran down, and contact was lost. Brazel reported that he found the debris on the ranch on June 14, 1947, although most UFO proponents put the time of this discovery as a few weeks later, in early July. Brazel didn't take the debris into Roswell until July 7, 1947, by his own account; this date is disputed as well. Recently, Charles Moore has developed a brand-new line of evidence even further supporting a link between the Roswell Incident and Project Mogul. UFO researcher Kevin Randle recently provided Moore with National Weather Service wind data for early June 1947. Moore, who has lived and breathed atmospheric physics most of his adult life, analyzed this data in detail. His analysis deals with three NYU flights : Flight 4 (June 4, 1947), Flight 5 (June 5), and Flight 6 (June 7). The Weather Service wind data are compatible with what is called a baroclinic weather system moving through the area. As this "trough aloft" slowly passes by, the winds aloft will shift from blowing toward the northeast, then toward the east, and then toward the southeast. At very high altitudes, however, this type of system produces high-level winds in the upper troposphere at cross directions to those at lower levels. Furthermore, the prevailing winds in the stratosphere during the summer months blow toward the west, while those in the transition region just above the tropopause blew toward the northwest during the early part of June 1947. For example, Flight 5 proceeded mainly east as it rose through the troposphere; when it entered the stratosphere, however, it was carried to the northwest. After some balloons burst and Flight 5 descended, it again headed in an easterly direction until it landed. When Moore used the Weather Service wind data and NYU altitude information to simulate the probable paths of the flights with recorded ground tracks (Flights 5 and 6), his results agreed quite reasonably with the measured balloon paths--Flight 5 drifted mainly to the east, landing near Roswell, while Flight 6 took a more southwesterly route. Moore then extended his analysis to Flight 4, the Roswell candidate. He used the wind data for June 4, 1947, and assumed the flight reached altitudes comparable to those of the subsequent two flights (which were made with very similar balloon trains). Moore's analysis indicates that after Flight 4 lifted off from Alamogordo, it probably ascended while traveling northeast (toward Arabela), then turned toward the northwest during its passage through the stratosphere, and then descended back to earth in a generally northeast direction. Moore's calculated balloon path is quite consistent with a landing at the Foster ranch, approximately 85 miles northeast of the Alamogordo launch site and 60 miles northwest of Roswell. Furthermore, the debris was strewn along the ground at a southwest-to-northeast angle (as reported by Major Jesse Marcel); this angle is entirely consistent with Moore's analysis. Charles B. Moore has been repeatedly criticized in the UFO literature for changing some of his earlier statements. He was interviewed for William Moore's book on the Roswell Incident. After hearing Bill Moore's description of the wreckage (including details of supposed 10-inch furrows running some 500 feet), Charlie Moore responded by saying: "Based on the description you gave me, I think that could not have been our balloon." Balloon trains like Flight 4 were far too light to make large furrows in the ground. The issue is not that Charles Moore said the wreckage couldn't have been a balloon--it's that he said his flights couldn't have plowed the alleged "furrows." On another note, Moore and other Mogul participants originally thought the debris Brazel found must have been from one of NYU's polyethylene balloon flights from early July 1947. He held this opinion until just a couple of years ago. These large, transparent polyethylene balloons were used for the first time ever in the summer of 1947 and would have looked strange even to experienced balloon watchers. However, after seeing the reports and photographs from 1947 for the first time, Charles Moore realized that Flight 4 was a much better candidate for the Foster ranch debris than a polyethylene balloon. So he has changed his opinions on the incident, but only because better data became available. 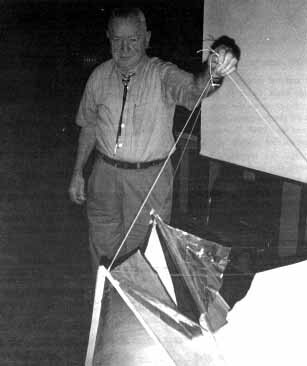 Atmostpheric physicist Charles B. Moore displays a radar reflector similar to those carried aloft on trains of balloons in Project Mogul experiments he helped launch from Alamogordo Army Air Field in New Mexico in June and early July 1947. New York University Flight #4 carried three of these reflectors and before being lost was tracked to within 17 miles of the spot where rancher Mac Brazel later recovered debris that prompted the famous "Roswell Incident" case. Moore's presentation included fascinating details on the background of Project Mogul. He noted that the discovery of the acoustic "duct" between the troposphere and the stratosphere came about as a result of a World War II era analysis of globally propagated sound waves produced by the volcanic explosion of Krakatoa in 1883. In one of their flights, he said the NYU crew attempted (without success) to detect explosions from the British destruction of German installations on the island of Helgoland (off the north German coast) in April 1948. While UFO proponents allege a lack of contemporary references to "Project Mogul Balloon Flights," Moore says the project was so compartmentalized that such references simply may not exist. Any mention of these flights will instead be labeled as NYU constant-level balloon research. Several UFO authors claim that the wreckage, and possibly alien bodies as well, were secretly flown to Wright Field in Dayton, Ohio for analysis. By coincidence, Moore says he and the rest of the NYU balloon crew stayed over at Wright Field the evening of July 8, 1947, en route back to New Jersey, just as the Roswell story was breaking. Moore says they first learned of the incident while in Dayton, and figured that it was probably caused by one of their recent polyethylene balloon flights. The September 1994 Air Force report indicates that the Brazel debris also made its way to Wright Field. During an Air Force interview of Mogul participant Colonel Albert C. Trakowski, he recalled a July 1947 telephone call from Colonel Marcellus Duffy, who was stationed at Wright Field and was intimately knowledgeable about both Project Mogul and military weather equipment. Duffy told Trakowski that a fellow from New Mexico came to Dayton, woke him up in the middle of the night, and showed him the debris. Colonel Duffy told the fellow, "It looks like some of the stuff you've been launching at Alamogordo." What is the bottom line on the Roswell Incident, NYU, and Project Mogul? In Moore's words, "When the wind information is coupled with the similarities in the debris described by the eyewitnesses--the balsa sticks, the 'tinfoil,' the tape with pastel, pinkish-purple flowers, the smoky gray balloon rubber with a burnt odor, the eyelets, the tough paper, the four-inch-diameter aluminum pieces and the black box--to the materials used in our balloon flight trains, it appears to me that it would be difficult to exclude NYU Flight 4 as a likely source of the debris that W. W. Brazel found on the Foster ranch in 1947." Dave Thomas is a physics and mathematics graduate of New Mexico Institute of Mining and Technology, and is currently a senior scientist at Quatro Corporation in Albuquerque, New Mexico. He is vice president and communications officer of New Mexicans for Science and Reason.